Well, my travels found me in Dallas for the weekend. There were a few games I could’ve gone to, but only one that looked interesting. 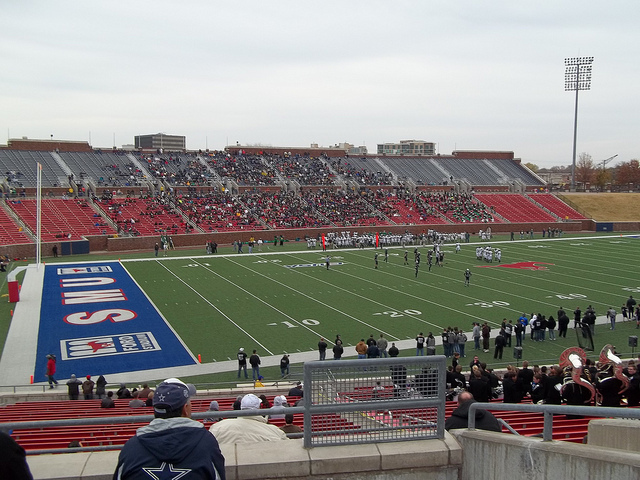 It was a 5A/4A state semifinal doubleheader at SMU’s Gerald S. Ford Stadium in Dallas. In the UIL, the playoff dates, times, and locations are determined by the two participants by mutual consent (or by lot in the event of a disagreement). Denton ISD had two teams playing this weekend. 5A Denton Guyer and 4A Denton Ryan. By luck, they got their site selections for the semifinals and they chose to make it a doubleheader at Ford Stadium. The stadium is nice. Recently built to house the SMU Mustangs, it is off US75 on Mockingbird Lane. The stadium is right in the thick of campus. A horseshoe shape with an inline upper and lower level. The west side sat a large club and pressbox structure that provided a nice bit of shade after the start of the first game. Tickets for the doubleheader were $12 with in-out privileges. The stadium is in a nice neighborhood with many places nearby to eat. It is on campus, and easily accessible. I took a $23 cab ride to the venue (and back) and got to the stadium right as the national anthem started for the first game. Tickets were sold from the north end of the stadium only. Guyer came in moving the ball easily in the first half. But a fumble into the endzone and missed plays yielded them no points. Longview, on the other hand, moved with ease and took a 17-0 lead at the half. Guyer then started their comeback. 17-7. 20-7. 20-14. 27-14. 27-21. With less than a minute to go, Longview had the ball trying to run out the clock. Forced to punt, Guyer sent the house and blocked the punt, returning it deep to the 15. Next play, Guyer scored on a 15-yard pass into the endzone for the tying touchdown. With ten seconds left, Guyer kicked the point-after to go up 28-27. Longview couldn’t do anything with the kickoff and the game ended. Longview was in control all game, and lost it with ten seconds left. Upended by a 17-point comeback. This was an amazing game. One of the best high school games I attended this year. After the game, I left and went walking around. Along Mockingbird Lane was a plaza with several restaurants and a Barnes and Noble. There was an Italian restaurant, a sandwich shop, ice cream shop and an Indian restaurant. That’s where I ate, WaiWai Kitchen. $8 for chicken curry was really good. It had coconut milk in the curry which gave it a softer taste than I was used to, but very very good if you try this style. It sure beat the stadium prices. $8 for a slice of pizza. $4 for a hot dog or hot pretzel. $3 for small bags of candies. A definite rip off. So, being able to walk about the neighborhood was a positive. After eating, I went to Barnes & Noble and read a few chapters from a book before finding my way back to the stadium with still plenty of time to spare for the next game. Ryan had a large contingent of fans. Many Guyer fans had stuck around for this one to cheer on their fellow citizens. Ryan raced out to a 25-7 lead in the early fourth quarter before going into prevent mode. Wylie, on the other hand, was just warming up. An early fourth quarter score was followed by a surprise onside. After faking the kick by running to the line, everyone but the kicker and a gunner retreated and the kicker blooped it over the line toward the sideline where the gunner took off and recovered it. Quickly, they scored again to make it 25-20 with over six minutes left. Wylie forced a punt and got the ball back. They drove the field getting to the one-yard line. With momentum on their side, it looked like Wylie would upstage the Guyer 17-point comeback with an 18-point comeback of their own. Alas, it was not to be as Wylie’s QB fumbled on the next play. Ryan recovered and ran out the clock. Both Denton schools advanced to their respective championship games. Meanwhile, Wylie and Longview had long rides home. Texas staged three titles games this weekend. The 3AD1 game was played on Friday at Cowboys Stadium and the two 6-Man games were played at Shotwell Stadium in Abilene. In 1A 6Man Division 1, Garden City beat Throckmorton by the score, 82-68. In the earlier game, Richland Springs 45’d Sterling City by the final score, 46-0. Anyone unfamiliar with 6-Man rules, whenever a team leads by 45+ points in the second half, the game ends. This game ended shortly after the start of the fourth quarter. In 3A Division 1, Henderon beat Tyler Chapel Hill, 28-21. This week, the titles games will be played at two locations. Cowboys Stadium for 5A, 4A, and 3A. While Mansfield will host 2A and 1A. Elsewhere around the country, Meridian (MS) lost the state championship game to South Panola, 28-7. This was the last non-playoff team I saw that was still in the playoffs. In Pennsylvania, the state championship games will also be played this weekend. Three catholic schools from the southeast part of the state made an appearance. 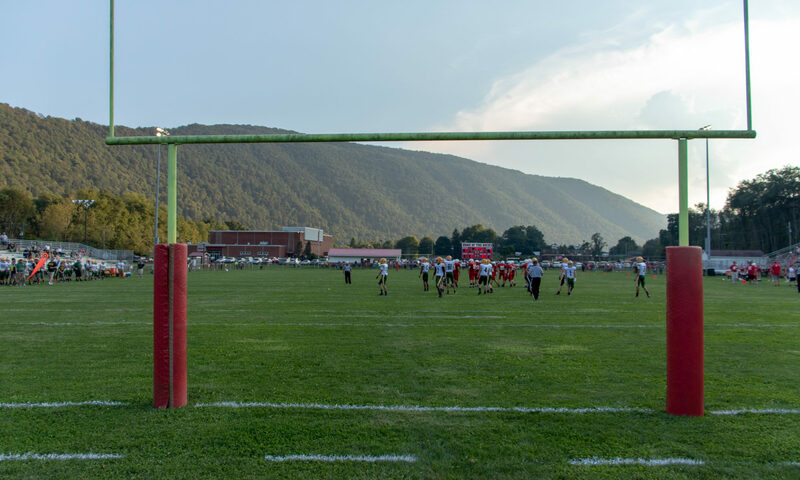 The 3A game features two catholic schools going head-to-head. Only 1A has an all-public matchup. Remember, just recently, the PIAA included the Philadelphia Public and Philadelphia Catholic Leagues in the state playoffs. All games are played at Hersheypark Stadium in Hershey, just outside Harrisburg. Three of the four WPIAL champions are still playing, North Allegheny, South Fayette, and Clairton. Only Clairton could be seen as a favorite. California has just announced their State Football Bowl Games for the year. All games are played the Home Depot Center in Carson just southeast of Los Angeles. Home to the Los Angeles Galaxy and Chivas USA, it is a 27,000-seat stadium perfectly suited for these games. Florida is the only other state still playing. Unable to see a game in the state, I did manage to see Florida teams play three times this year. Dwyer played Glenville at the ‘Shoe, while Manatee and Cocoa played Pennsylvanian teams at the Wolvarena in Turtle Creek at the Rally. Four of their eight games were played this past weekend, while the remaining four big school games will be played this weekend over two days. And as the high school football season draws to a close, these two games will–probably–be my last high school games of the year. I seriously doubt i could manage to be anywhere near one of these four cities for the title games next week. I’ve seen 52 games this year. I can’t even begin to describe the many great finishes, amazing performances, unusual feats, interesting factoids, memories of the atmosphere at the game, the stadiums, the bands, the Friday Night Lights. I’ve seen 100 different high school teams. Only Steubenville, Huber Heights Wayne, Akron Buchtel and Woodland Hills (PA) did I see twice. The odds of seeing a game next week is slim. So, this is how I’ll probably end my little high school football odyssey for 2010. I still have two more football games, but they’re both NFL. I may try and catch a bowl game somewhere. I’ve hoped you’ve enjoyed my weekly write-ups and wish you all well in the offseason. I watched some pretty bad teams that aren’t representative of the top level of each state, however, the quality of play compares very favorable. As for fan support, Ohio is up there, but I give the edge to Texas for fan support. Missouri, Iowa, and California get the worst. Utah and Wisconsin had good all day events that went smoothly. Pittsburgh’s WPIAL finals were a tad boring, unimaginative offenses and the crowds were very disappointing. Minnesota had so-so quality play, average-to-good fan support for the travel, etc. However, Minnesota’s 12 games in two days was by far the most fun I’ve had all year. It’s just an amazing marathon of football. No downtime, either. Ten minutes after the whistle the next game kicks off. Texas gets the edge in fan support simply because a 5A and 4A doubleheader with $12 (all day tickets) for a doubleheader that had 12 and 5pm start times had a very good sized crowd filling a college stadium. Not huge, but vocal and had a lot of neutral fans in attendance. Ohio would be up with Texas if the title games were higher. For non-playoffs, Ohio is up there equal with Texas for fan support for any/all games. They just take it very seriously and the towns come up to support the teams (I’m basing this on two small west Texas towns who looked like they brought the whole town). The biggest disappointment was Meridian (MS). Great team. Great stadium (seats over 10,000). Horrible fan support. Overpriced tickets ($8 at the gate). Des Moines North was the second most disappointing game. Des Moines doesn’t support HS football. For the largest classification, they had a stadium that would make OHSAA D6 schools be embarrassed. The fans didn’t fill it, and the team was abysmal. California was just a bad overall ‘event’. Jurupa Valley and Norte Vista. Good game. But lackluster fan support. Nice, but very little metal stadium. Real grass. Fans who thought it was cold when it was 55-degrees out drinking hot chocolate. Other than that, the disparities in the states is noticeable. *-only multigame events count. This is just my personal summation of the quality of the play, the excitement of the games, atmosphere, fan support, stadium, access, price, etc. I’ll list these chronologically. It would be unfair to try and rank them as I saw a lot of great games (and a lot of horrible one-sided affairs, like DM North-DM Lincoln). This is only the games. Both Texas games were great. A 17-point comeback by Guyer and an 18-point comeback thwarted at the one-yard line in the second. My favorite ‘total experience’ was White Deer at Memphis in Memphis, Texas. I had seen that little concrete stadium in that small West Texas town so many times that I promised myself one day I would see a game there. And it was a blast. Even if the home team was completely out-manned. The townsfolk stayed to the end supporting their kids, friends, classmates, siblings, etc. Only $3 for a ticket. Great stadium. Great fan support. Cheap food and water. Great halftime (it was homecoming). Great bands. Great visitng support from a team 80 miles away in the D6 level of Ohio. Just a game I will never forget. You can throw out the 62-20 score. It is one of my favorite games of all time, any year. I would love to see another game at that little concrete jewel in West Texas in oblivion between Amarillo and Wichita Falls.